University of Nottingham Malaysia > Blogs > UNM Campus News > Campus news > The Champion and Best Speaker of the BDO Challenge 2014! 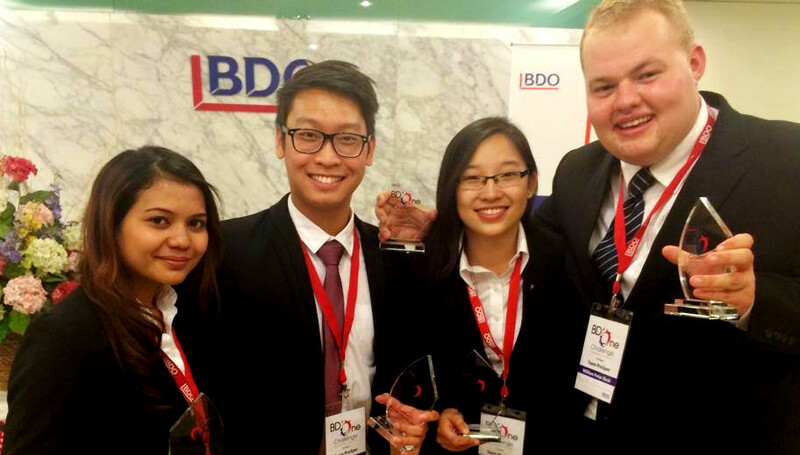 NUBS students have emerged the Champion and Best Speaker of the BDO’s Be D One Challenge 2014 held on 13 December. BDO in Malaysia is a member firm of BDO International, the world’s fifth largest network of professional firms providing audit, advisory and tax services to businesses ranging from established multinational conglomerates to growth-oriented organisations, whether public or private. NUBS was represented by Team ProSper (Professionalism, Sustainability, Personalisation), with William Buck (winner of the Best Speaker Award), Tan Lee Xiang, Fabiolla Netto Martin and Chen May Yie. They brought home a cash prize of RM3,000, trophies and on the spot job offer upon graduation.